The American Woodcock is actually a shorebird, a member of the same family (Scolopacidae) as sandpipers, knots, phalaropes, curlews, dowitchers, and snipe. Nonetheless, this bird will not, in most cases, be found anywhere near a marine shore. The woodcock’s Latin name is Scolopax minor, basically “smaller woodcock.” It answers to a host of colorful nicknames, the most popular and amusing of which is “timberdoodle” though it is also known as bog sucker, mud snipe, wood snipe, Labrador twister, night partridge and Hokum Sake. The American Woodcock has developed some astonishing adaptations to its woodland habitat, not the least of which is its cryptic, dead-leaf plumage for camouflage and a long, prehensile bill, all the better to extract earthworms and other invertebrates from deep soil. The ears of most bird species are positioned directly behind their eyes. The woodcock, on the other hand, deploys its sensory organs somewhat differently, with its eyes placed very far to the back of the head and ears directly in front of each eye closer to its bill. This sensory array allows a woodcock probing the soil to actually hear its subterranean prey while remaining visually aware of activity above ground. The American Woodcock is a bird of Eastern North America, restricted in range to territory east of the Mississippi. This species is migratory, wintering in the south and breeding in the north. The woodcock has specialized ecological requirements. It actually needs four different types of habitat, one type of hardwood stand for feeding, another for nesting, large fields for night roosting, and clearings for courtship displays. The plump, some might say dumpy, woodcock clocks in among the slowest flyers in North America. This unfortunate trait is no doubt one reason why it is one of the nation’s most popular game birds despite being no bigger than a robin. Rumor has it that the bird is also pretty tasty. Audubon reports that up to two million American Woodcock are estimated shot annually across its range, but attributes its declining population more to a decrease in the quality and quantity of suitable habitat than to human predation. One last fun fact about this bird is that it is crepuscular, most active during dusk and dawn. That is how we found ourselves standing in the middle of a grassy meadow well after sundown. Though the woodcock didn’t turn up, the trip was far from a total wash. We spotted Eastern Bluebirds, Dark-eyed Juncos, various waterfowl, and plentiful bats. 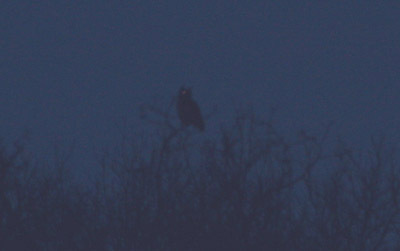 We also identified a lone Broad-winged Hawk while the sun was still up and an imposing Great-horned Owl silhouetted ominously against the twilight sky. This is a family-friendly blog, so I will refrain from jokes about the title. But you may want to get a doctor to check that out. Sorry, I couldn’t resist. Delete me if you must.